A man killed in Queens over the weekend was at least the fourth pedestrian in 2012 to die in Peter Koo’s City Council district, and at least the fourth pedestrian fatality in the 109th Precinct this year. All four crashes were hit-and-runs. Dante Dominguez, a 45-year-old father of three, was struck by the driver of a black BMW at the intersection of 41st Avenue and Union Street in Flushing on Friday at approximately 11:20 p.m., according to reports. The driver fled the scene. Less than two weeks before Dominguez’s death, 76-year-old Victor Florio was killed on Booth Memorial Avenue by a motorist who ran from the scene on foot but was later apprehended. In March, a hit-and-run driver took the life of an unidentified 65-year-old man at 149th Street and 45th Avenue. The MTA bus driver who struck 22-year-old Meilan Jin at Northern Boulevard and Union Street in February did not stop. Council Member Koo is a fan of public plazas, but he hasn’t had much to say about traffic-calming during his first term, except to declare his opposition to bike lanes, which can improve safety for all street users. 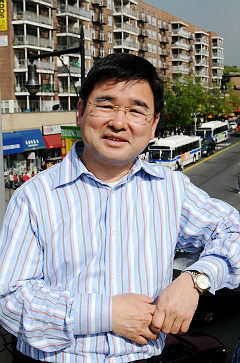 To encourage Koo to take action to improve street safety in his district and citywide, which could include lending his vocal support to the Crash Investigation Reform Act, contact him at 212-788-7022 or pkoo@council.nyc.gov. You can also awaken his dormant Twitter account @PeterKoo2009. The 109th Precinct made headlines in 2009 when an officer driving at high speed slammed into a pedestrian on Queens Boulevard, a suspicious crash that NYPD pinned on the victim. To voice your concerns about neighborhood traffic safety directly to Brian J. Maguire, the precinct’s commanding officer, go to the next community council meeting. The 109th Precinct council meetings happen at 7:30 p.m. on the second Wednesday of the month at the precinct. Call the precinct at (718) 321-2268 for information. The wife of Dante Dominguez is very upset and wants the media and the community to know that this can’t go on. There are too many hit and runs. She is inviting everyone to the funeral viewing tomorrow (Friday, Nov. 9 from 5pm to 9pm) at Quinn Fogarty Funeral Home on 162 St and Sanford Ave. Please call Lois Lee at 917-886-2294 about for more info. The irony of my husbands death was that he was hit by a driver who did not have a heart to do what I always believed was human instinct. STOP and HELP. Dante was a caring man, a man who would support his family, a son who would always make it a point to visit his parents and instill the morals and values to his children which in present day appears to disintegrate. I cannot bring my husband back. No matter how much I pray, I live with the faith that we will one day be reunited where pain an suffering no longer exist. Please support my sister tay in this cause.. I miss my uncle Dante Dominguez so much. He was such an amazing person. Not knowing that my uncle had been in that hit and run accident, I remember passing by the scene over by 41st Ave. and Union St. right after I left work. Every time I close my eyes I remember every single detail of that horrible night. I’m tired of the hit and runs happening in this particular neighborhood of Flushing, NY. No loved one out there should be losing their life over a hit and run. I want justice to be served. I need for my uncle’s case to be solved. So that my family can be at peace even though it doesn’t change the fact my uncle has gone. I know that this man was very special to his family and they held him very dear to their hearts. My condolences and prayers go out to everyone who was effected by this horrible tragedy. As I have only seen the aftermath, I can only wish to have met him, as I have only heard the best of him.. Knowing this, I have to take into account that -THIS- is ultimately what any of us can hope to have when we’ve passed, is to have left such a positive impact on the ones that he loved. You will be forever appreciated, and greatly missed..
Much respect to the kind person who took the time to say kind words about Dante even though he didn’t know him. I loved Dante along with many others known as RWS and Dante will never be forgotten. They say we are here on this earth for a short time but losing Dante in a hit- and- run is unexceptable. Dante was truly special and whoever did this must turn themselves in. Turn yourself in or forever live tormented by the fact that you took a living legend from this earth. Shame on you for existing as a coward for so long!! Please support my cousin. No one should have to go through all the pain this family has gone through. I only saw him a few times but I always heard good, positive things about him. Please help if you have any information. They need to put cameras and for driving should be stricter. We have to spread the word and have Koo realize what he really needs to do before a fifth hit and run comes. They need to put a stop on this. I miss my cuzin Dante so much. He was like brother to me. it breaks my heart because he only gotten to see my daughter only a couple of times. He really means the world to us. Please lets make this hit and run to a stop. We have to do it for him. Also this can happen to anyone so lets put this to a stop. I miss you Dante. You will always be in outçr hearts. This is something that is a life and death situation. Please help pass this law, so we can bring these type of people to justice. This family lost a husband, father son, brother and friend. Please spread the word and unite as a community to put pressure on the law makers to make this happen. It’s very disappointing to see the lack of effort people in the community of Flushing people are putting toward this incident. People need to gget the courage to speak up to the goverment or authorities. Dante and Tay Dominguez’s daughters attending our afterschool program at PS 20 which is just one block away from the accident site. We remember when Dante would come pick up the girls after school. He was very loving and provided for his family. He was just going to the corner store to buy food for the family when he was hit. All of us at CPC/PS 20 are heart broken and we empathize with his extended family. What kind of world do you live in that the person who did this, didn’t stop to offer help? Something must be done about these callous and dangerous drivers. We love you, Tay, and remember Gieselle and Victoria will always have a place at our center. We miss you all. We will be there Thursday, May 30 for the rally and press conference.